Roberto Mancini once insisted his patience with Mario Balotelli was "limitless" - but the sight of this gifted but unfulfilled talent boarding a plane to return to Milan suggests the goodwill has, after all, finally been exhausted. Manchester City's manager could not have tried harder to disprove his great rival Jose Mourinho's theory that Balotelli's volatile and unpredictable temperament - something "the Special One" failed to control at Inter Milan - was beyond management. The Italian's notoriously hardline stance on discipline often slackened when it came to the 22-year-old he signed from Inter for £24m in August 2010, on the basis that Mancini knew an outstanding talent, requiring careful and sympathetic handling, lay beneath the troublesome exterior. Of course there were moments, such as the recent clash at City's training headquarters, when Mancini boiled over at Balotelli's insubordination, but in other moments it was clear he shared an almost father-and-son bond with the striker. When Balotelli erred, and he did so often, Mancini's demeanour was often not rage but almost sadness that what he clearly regarded as potentially world class gifts were as camouflaged as the Bentley the young striker drove around Manchester. 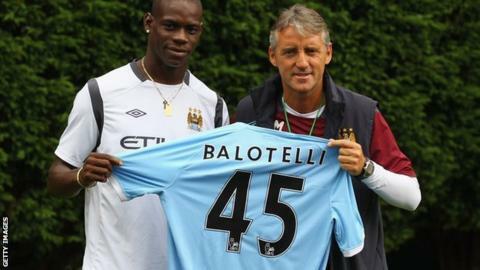 And that is why Mancini will have genuine regrets that Balotelli has joined AC Milan. No-one was more desperate for him to succeed than his manager - but even he has accepted time had run out for Balotelli at the Etihad. Whatever the manager's sentiments, the ultimate decision has to be based on performances on the pitch and, quite simply, Balotelli has not produced enough to make him worth the trouble or the indulgence. Mancini freely admitted that he might have been tempted to rain blows on Balotelli's head had he been a team-mate during the manager's own playing days. He also confessed he could never trust Balotelli - although his actions were often at odds with his words. When Balotelli was sent off in what appeared, at the time, to be a defining defeat at Arsenal last April - one that left City eight points adrift of title rivals Manchester United - Mancini appeared to roll the credits on the striker's career in England. He said: "I like him as a guy and a player. He is not a bad guy and a fantastic player but I'm very sorry for him as he continues to lose his talent and his quality. I don't have any words for his behaviour. "I hope for him he can understand he is in a bad way for his future and I really hope that he can change his behaviour." A few weeks later Balotelli was back in favour and delivering a crucial touch that led to Sergio Aguero's injury-time winner against QPR and gave City their first title in 44 years. Mancini's inner belief in Balotelli resurfaced when, against logic, he was selected to start the Manchester derby at Eastlands earlier this season. He gave a dismal performance and was substituted after 52 minutes in a game that City lost 3-2 and this, it seems, was one of the moments that contributed to his departure. The manager's words afterwards had a distinctly familiar ring as he said: "I love Mario as a guy and and a player but it is important for him to start to think about his job. He has everything to play well but he can't continue to play like today. "We want more from Mario because he has everything. When you have a player of this quality you can't understand that he could continue to throw it out of the window. It is incredible. "I saw a player like this in my life with fantastic quality but in the end he did nothing. I don't want Mario to finish like this." Another great City maverick, Rodney Marsh, has been critical of Balotelli when some might think him a kindred spirit. But in contrast to Balotelli, Marsh was a free spirit who delivered. Some blamed his £200,000 arrival from QPR as the reason City threw away a healthy title position in 1972 - but this was not down to Marsh's attitude or ability, simply a case of a new signing being introduced into a settled and winning team at precisely the wrong time by then manager Malcolm Allison. Inside City, Balotelli was not regarded as a villain or troublemaker, rather an almost child-like individual whose off-the-wall personality led him into scrapes. There was never a suggestion of malice. And at all times, there was the hope Mancini's approach would finally result in all the right buttons being pressed and the full scale of his undoubtedly extravagant ability being brought to bear. If it is to happen, it will now happen elsewhere. Why is it always Balotelli?